Are you ready to let go of negative energy? Are you looking for assistance with ascension? Every household can benefit from this self-healing tool! 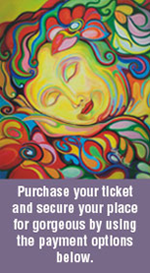 With this Healing CD series, Sunshine Coast Mindset Specialist and Quantum Healer, Michela F. D’Addario, guides you powerfully yet gently to cleanse the accumulated energetic imprints you have collected through your day, your week and throughout life, that may be reducing optimal organ function and emotional, mental and physical wellbeing. As negative energy residing in our body can create anxiety, clearing the negative energetic pathways often brings a lovely sense of calm and inner peace. Just like stress, negative energy accumulates over time. By cleansing your energy on a daily or regular basis you reduce the internal stress that can compromise your wellbeing and state of mind. This is a comprehensive and essential energy cleanse that can benefit anyone wishing to improve their vitality, stamina and wellbeing. 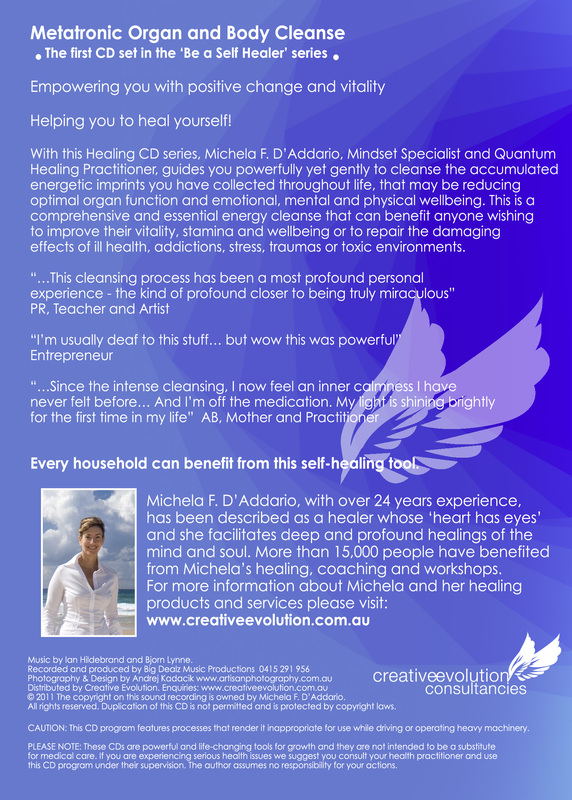 Michela utilises Metatronic Quantum Healing frequencies, visualisation, subconscious healing and the ancient philosophies of the Healing Tao to bring you these effective healing processes. Clients suffering from a range of symptoms have reported relief including those affected by the symptoms of fatigue, infections, flu and colds, sinusitis, candida, thrush, menstrual pain, congestion, being overweight, trauma, toxicity, headaches, depression, anxiety, addictions and cravings, insomnia, stress, mind fog, side effects of detox diets and the side effects of medication. During this CD journey you will be introduced to the wonderful quantum healing frequencies of Metatron’s Oceanic Healing Light that completes your energy cleansing process, leaving you feeling sparkling clear, and revitalised. “Before the cleansing process with Michela and Metatron I was finding it difficult to maintain my equilibrium on a day to day basis. I felt heavy with fatigue, anxieties and fears. My usual meditations were only temporary fixes for this encumbering state, so I began to believe I would just have to manage feeling pretty awful, most of the time. Clients have reported feeling more confident, refreshed, resolved, calmer, happier, lighter, optimistic, more abundant, healthier, more intuitive, insightful, energized, stronger, symptom-free, clearer and more motivated after just one cleansing-healing experience, and have been amazed by the power of the process and how the positive effects have stayed with them. 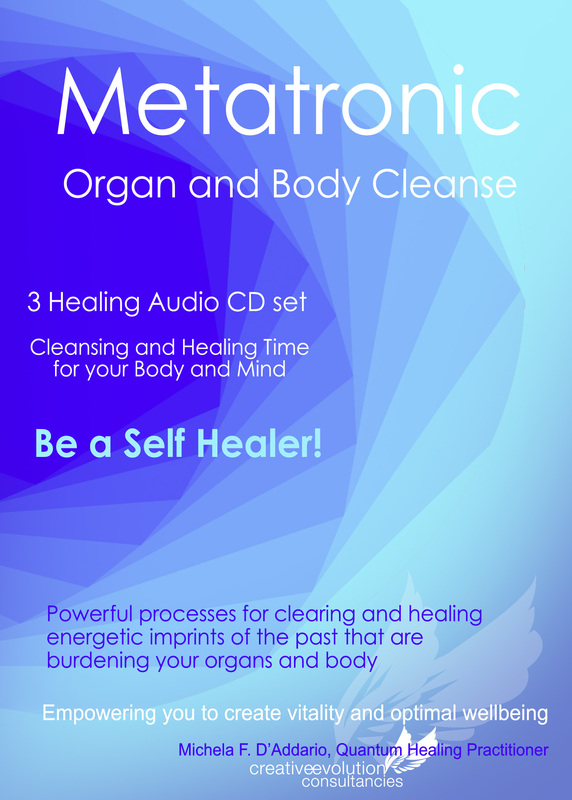 By purchasing this CD series, at half of the cost of this particular healing consultation with Michela, you have the added benefit of repeating the healing process as often as you like. This healing process will support any other treatments or modalities you may be working with. Michela has also included two shorter versions of the cleanse and healing that you can easily fit into your daily schedule along with a unique grounding process that you can utilise to strengthen your inner voice and energetic protection, and the wonderful calming experience of Equilibrium Breathing with gratitude. This Healing CD Series makes a beautiful gift of healing. Imagine giving a loved one the opportunity to cleanse and heal their energy and calm their soul on a daily basis! We will happily send a gift message on your behalf to your loved ones. Cleansing dense toxic energy sitting in your system is also spiritually very beneficial as it can clear the ‘background noise’ and enable you to better tune into your inner voice, more easily link up with your higher wise self, and better hear and feel divine energy and angelic guidance. Some clients have utilised this process for that Soul purpose. Metatronic cleansing and healing will support your ascension path as you clear the old outdated energy and make way for the new… It is highly recommended during these next twelve months in particular when cleansing negative energy is paramount if we are to successfully ride the wave of quantum energy leaps being offered to us now. Order now to receive your personal self healing and ascension tool! Just click here on the contact page let Michela know you’d like to order a CD Set and include your postal address along with your other details. There is no charge for postage within Australia. For a limited time only you’ll receive one month’s email support to assist you personally if you have any specific questions or queries relating to healing with the CD.